Today we drove to Barrydale from Montagu. It takes about 1 hour; the drive is nice and scenic. We decided to start at Joubert-Tradouw as they are open Saturdays from 10am – 2pm. When we got there, it was closed, which was disappointing. As there is only one other winery in Barrydale open on a Saturday, which is Barrydale Winery (open from 10-3pm), we were disappointed to have driven all this way out here for just one winery. 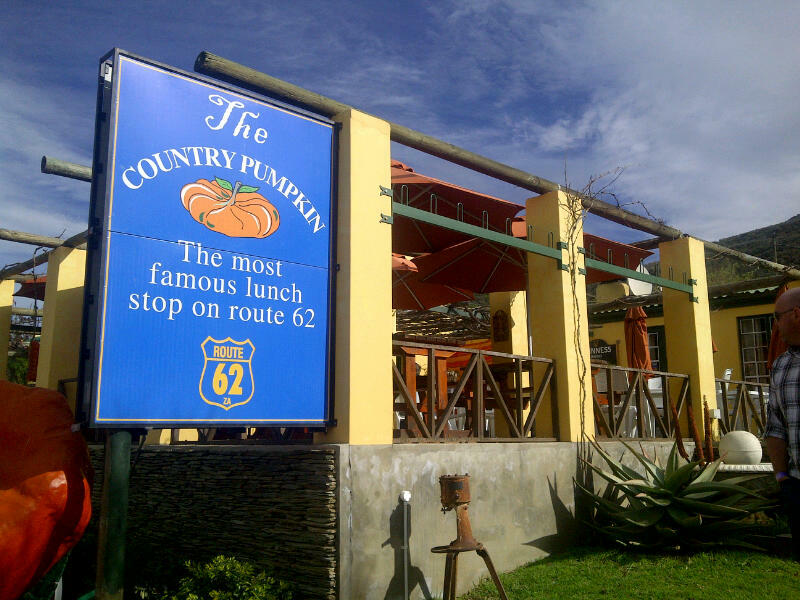 Seeing as we now had plenty of time on our hands, we decided to have some lunch in town at The Country Pumpkin. While there, we mentioned to the owner that Joubert-Tradouw Winery was closed. He was very surprised and concerned, he said its very unusual that they were closed, so he made a call to the winemaker. 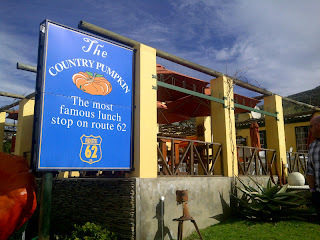 (I have to say the owner of The Country Pumpkin was very kind and hospitable. We really appreciated that he contacted the Joubert-Tradouw winemaker for us, and for helping us be able to enjoy a tasting at the winery. I highly recommend visiting his restaurant, they have a very nice menu with South African style food, the service is very good and the outdoor courtyard is lovely). We sat down for lunch, and after ordering our drinks, the winemaker of Joubert Tradouw greeted us at our table. He had been on his fruit farm, and had dropped what he was doing to take us to his winery, thanks to the owner from The Country Pumpkin making a call for us. The winemaker (Meyer) is a young guy, very friendly, polite and hospitable. We had a nice chat with him over a cup of coffee and then made our way to the winery. It turns out he had closed the place today because it had been quiet recently. Murphy's Law isn't it?! Only 10 minutes after we started the tasting, another group arrived, so it was nice to see others had also benefited from Meyer opening the tasting room and vice versa. We started the tasting with the 2010 and 2011 barrel fermented Chardonnay (R120). It is amazing how different they are. My boyfriend and I both preferred the 2010. It was light, yet medium bodied, a little sour, and had stone fruit flavours, with a very nice lingering aftertaste. The 2011 had an amazing initial fruit flavour bursting through with slight caramel tones, but I found the aftertaste not to be so great and I found it to be rather dry. The Cabernet Sauvignon, Syrah, Cabernet Sauvignon/Cabernet Franc, were all very nice. The latter is not bottled yet, we got to try this one from the tank. This was my favourite, but it is also very different from the other two reds. It had a gorgeous colour to it, was light, and delicious. I can't wait to buy this wine once it is available!! This ended up being a really memorable wine tasting experience! I highly recommend visiting this winery if you are out this way, and perhaps call this winery in advance if you plan to visit on a Saturday in winter, just to make sure they are open. They have a deli here, with a really lovely outdoor seating area. If you are heading out here at lunchtime I recommend coming here. I will definitely be visiting this winery again if out this way. I can see myself spending a lovely sunny afternoon sitting outside drinking wine and eating the platters of cheese and cold meats! !